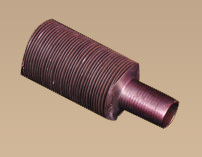 Aluminium fin strip is wound & embedded on a groove and securely locked by closing the groove with the base tube metal. This ensures maximum heat transfer at high temperatures. 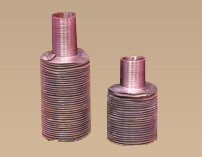 Maximum Operating temperature for G fin is 450 deg C.
Tube Material - Carbon steel, Stainless steel, copper, Copper Alloys etc.